Cash Payments from the People’s Treasury (Bait al-mal) to the Baha’is was declared religiously unlawful. Shiraz- Reporter of the Islamic Republic: Following a government cleansing yesterday, it was announced by the Department of Education of Pars province that so far, ninety-six cases have been investigated and their decrees have been issued and forwarded to the five-member Central Committee of the Ministry of Education for final verdict. Furthermore, Mr. Aboulahrary, Director General of the Board of Education in the Province, added that up to now final verdicts have already been issued for twenty cases of which fourteen individuals have been expelled, three individuals have been referred to the Islamic Revolutionary tribunal in Shiraz on the charge of collaboration with SAVAK, and six others have retired. As for the other 46 individuals, ready-to-serve decrees have been issued. He further added that according to Article 440 of the Country’s Employment Code, forty-five individuals have also been expelled on the charge of their belief in the sect of Bahaism. Also based on gathered information, some of the employees of the board of Education of Province of Fars who were fired on the charge of Being Baha’is objected to this decision. However, the Ministry of Education announced that after retirement, issuance of a supplementary verdict does not have legal justification. 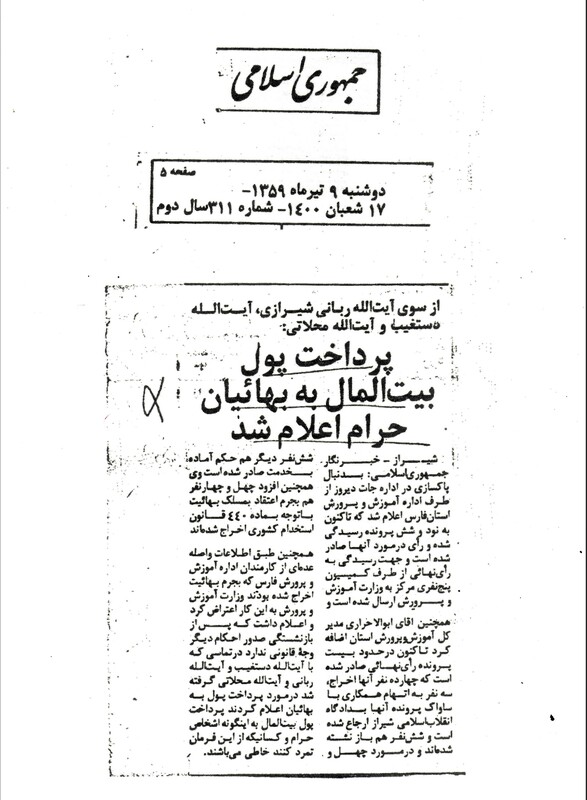 After contacting Ayatollah Dastghayb, Ayatollah Rabbani and Ayatollah Mahallati for elucidation about payment to the Baha’is, they declared that any payment from Treasury of the People (Bait al-mal) to these people is unlawful and those who disobey this order, will be considered to be in violation of the law.